Every Mama needs some inspiration, some days more than others. 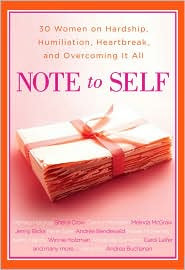 This little book, Note to Self, conceived and edited by the talented Andrea Buchanan, is big on empowerment. A compilation of essays by 30 powerhouse women, this tome is filled with stories that will make you laugh, give you pause and break your heart. Raw and real, these stories give full voice to all women who, sooner or later, must rise from the ashes and take flight, like the Phoenix. Do yourselves a favor, Mamas: Buy this book. Thanks for the book recommendation. Glad to hear you are on the mend! I have read parts of this book. Really great, especially Mariska Hargitay's piece. Might have been influenced by her TV show, which I really like.